After running an unofficial week of Shag in Herrang, Peter returned to London and set up ‘Shag Pile’ to grow the London scene through high quality weekly classes, regular workshops and special events. Meanwhile his Herrang students set up scenes in Melbourne, Stockholm and Brazil. As a performer, he has danced in films including ‘Gambit’, ‘Me and Orson Welles’ and ‘Avengers 2’. Aila is a highly trained dancer and performer, with deep experience in a huge variety of dance forms. As choreographer and director of internationally renowned flapper troupe ‚The Bee’s Knees‘, she has performed at events all over the world including the Venice carnival. Aila also leads London’s Shag performance group ‘The Shag Pilots’, who can be seen shaking their stuff on youtube. 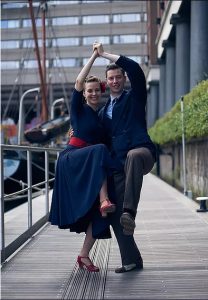 Heiko and Larissa are the founders of the Basel Jitterbugs.Together they teach weekly classes and workshops in Lindy Hop, Balboa and Collegiate Shag. They love to combine all of these dances based on the tempo and energy of the music and inspired by original swing dancers from LA. Their Collegiate Shag can be described as smooth and elegant, combined with crazy happiness. They love to play around with different styles and energy levels of Shag. Their teaching is designed with clear structure and a focus on solid technique. They are always seeking for a good and fun class atmosphere where everybody can find motivating challenges. Besides teaching and social dancing they love to show off in competitions and to spread their passion for swing dancing in shows. Recently they placed in several finals, for example 1st at the RTSF Shag Battle in 2016, 2nd in 2017 and 2nd at the Warsaw Shag Festival Strictly 2017. In 2011 Marta and Rafał started their swing dancing adventure in SWINGOUT.PL studio in WARSAW. 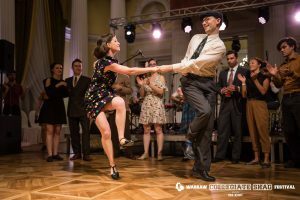 At the beginning they danced Lindy Hop only but when Collegiate Shag arrived to Poland, where they come from, they fell in love with it for good. Since 2014 they take part in the biggest Collegiate Shag festivals in Europe and they learn from the best. They performed for the first time with a group called Warsaw Shag Team at Warsaw Collegiate Shag Festival 2015. As a group they keep performing during various dance festivals and other events. During the dance they focus on technical aspects of dancing, connection between the dancers and musicality. Marta and Rafał put the emphasis on the basics of the dance – they treat it as a tool for clear communication between partners and a way to create something fresh and inspiring. They both state the dance should not only look great but it should also be pleasant for the dancers. They are always willing to share their knowledge and experience. So far they were teaching Collegiate Shag in Poland, Italy and Spain. Frances “Fancy” Dougherty Hailing from Los Angeles, California, Fancy fell in love with Jazz, Lindy Hop and Shag in 2008. She’s been hooked ever since, devoting herself to the technical mastery of historical dances and her own unique style. She has appeared in music videos, and been on numerous television shows for the US, Mexico and France. She currently lives in Paris, where she teaches swing locally with partner Alex Dreyer. Fancy holds titles in Fast Lindy and Shag. She was nominated for the California Swing Dance Hall of Fame in 2014 and is the four-time Shag champion (2010, 2011, 2012 and 2014) of the National Jitterbug Championships with Shag partner Steve Sayer. Patrick O’Brien has been dancing since 2011 and has been actively involved in driving the Shag revival in Europe, teaching weekly classes, international workshops and performing and was also part of the Euro Shag team. He can be seen shagging up a storm on London’s and Europe’s dance floors. Patrick’s teaching style is characterised by breaking down moves to the core and then building them up step-by-step so you can conquer even the hardest sequence. Focussing on a strong follow-lead connection he aims to create a relationship between the partners and express individual styles and characters of each dancer. Mostly inspired by the old-timers and the old-school scene in Los Angeles, his style is smooth and elegant. He loves coming up with new moves and giving them names such as the ‘Cinderella turn’ or ‘Tumble dryer’.